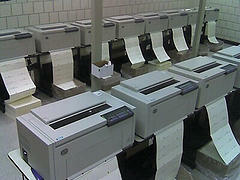 We are currently trialling a new printing system on the upper level of the LRC that involves charging for prints. A2 students will remember this system from last year - AS students, read on, as this will all be new to you. Black and white printing is charged at 5p per side of A4 - but don't worry - we are giving students some free print credit!! All students will be given £7.50 worth of credits which will be topped up each term. However, when the credits have vanished, you will have to buy some more - so make sure you only print what you need. Please speak to a member of LRC staff for further details.